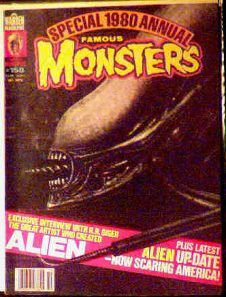 October 1979 issue of FM featuring an interview with H. R. Giger, the artist who created Alien. Mint condition. Giger came up with many organic-looking sets, where you couldn't tell where the sets began and the Aliens ended. Website design and hosting by Sohodojo Business Services. Item 134 of 466 items displayed in viewer. 0 items in cart.